We try to anticipate questions you might have and provide the answers here. 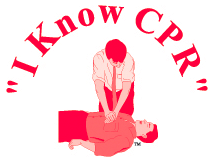 If you need additional information please email us at info@iknowcpr.com. Can I be held responsible if something bad happens to the person I'm helping? The law states that a person offering aid must do so in a reasonable and prudent manner within that person's level of skill. Once a person has begun care, that care must continue until other help of an equal or greater skill level is obtained or until the rescuer has reached a level of exhaustion that makes continuing impossible. A lay rescuer will be within the bounds of the law if the care offered is reasonable and prudent given the situation. What if I don't remember what to do? This is a common fear of newly trained people. Our training programs utilize a seeing, hearing, and doing method of training which make them effective in increasing the participants retention skills. What do I need for an emergency first aid kit? The following items represent a typical emergency first aid kit that would complement the training a student receives in a basic first aid course. This emergency kit is designed to manage both a life-threatening event as well as everyday needs and should be kept intact and ready to use. You may also find the following items useful. These items have expiration dates and should be checked on a regular basis. If my CPR skills aren't perfect, won't I just do more harm than good? The sooner CPR is started, the greater the chances for survival. Unfortunately, many people who have been trained in CPR are reluctant to administer it for fear of doing it wrong. It is important to remember that when indicated, good CPR is better than bad CPR, but even bad CPR is a million times better than no CPR at all! Can I get a disease by administering CPR to someone who is sick? Many people express a concern about the risk of HIV / AIDS and other infectious diseases when performing mouth-to-mouth resuscitation. This is an understandable concern which has to be weighed in each case individually. Most layperson CPR however, is performed on a close friend or loved one. The background health history and risk factors will usually be known to the rescuer. Compression-only CPR is another option when the person is unknown to you. Abolishing myths and minimizing any actual or perceived risks associated with CPR is a core element in most training classes. Why do I need CPR training? CPR can not only be used when heart attacks strike, but may save victims of drowning, electrocution, suffocation, and drug overdose. CPR not only saves lives, but provides peace of mind during and after an emergency. People often feel helpless when they witness a heart attack, but with CPR training, you will know exactly what to do. Regardless of the outcome, you will know that every possible measure had been taken to assist the person in need. You will likely find this reassuring during what may be an otherwise difficult time. According to the American Heart Association: "An automated external defibrillator (AED) administers an electric shock through the chest wall to the heart. Built-in computers assess the patient’s heart rhythm. From this information, the AED determines if defibrillation is needed, it then advises if the administering of shock is necessary. Audible and/or visual prompts guide the user through the process." For more information, go to AED Assistance.